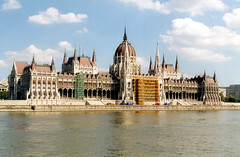 BUDAPEST – Hungary will implement new taxes in order to raise the revenues necessary to met its current financial targets. In a press conference held in Budapest on October 17th the Minister of National Economy György Matolcsy announced that the government of Hungary will turn to taxation of financial institutions in order to raise an additional HUF 367 billion in tax revenues to bring the national budget deficit to below 3 percent of the country’s GDP. The newly announced tax measures are also intended to aid Hungary in meeting the financial goals laid down by the EU and the International Monetary Fund as part of the government’s negotiations for a EUR 15 billion loan. According to the Minister, Hungary will raise the its tax on transactions carried out by all financial institutions from 0.1 percent to 0.2 percent. This tax was originally announced in July 2012 as part of a government austerity package, and is scheduled to apply from early 2013. The Minister announced that the government has also dropped its plan to halve the rate of tax applied to the profits generated by financial institutions. During the press conference György Matolcsy explained that raising the taxes is an unwelcome necessity but “…we undertake these measures to preserve Hungary’s cohesion funds”.